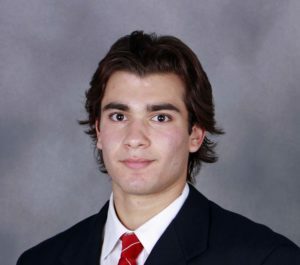 The Wisconsin men’s hockey team won its second straight game against a top-10 ranked opponent on Thursday night, knocking off 8th-ranked Ohio State 3-1 in Columbus. It’s the second straight win over a top-10 ranked opponent, having beaten 7th ranked Minnesota in the second game of their series last weekend in Madison. Luke Kunin scored Wisconsin’s first goal, 3 minutes 24 seconds into the game, short handed. Matthew Freytag scored later in the first, giving the Badgers a 2-0 lead at intermission. Ryan Wagner added an empty-net goal in the final minute to seal the 3-1 win. The Badgers (12-8-1, 5-2-0-0 Big Ten) won their 12th game of the season. It equals the win today for the team over the last two seasons combined. The two teams wrap up the series on Saturday night (6 p.m.) at Madison Square Garden.